ProSupps® Iso-P3™ was created to not only be the highest quality protein on the market today, but to change the way you think about protein. Containing 25g of complete, premium isolate protein sources, Iso-P3TM goes beyond ‘just’ whey protein isolate. Harnessing the power of multiple protein sources including; whey protein isolate, milk protein isolate and whey hydrolysate, IsoP3TM is designed to not only ignite protein synthesis, but keep amino acid levels elevated for hours, maximizing your potential for growth and repair. * Don’t just settle, raise the bar and expect more from your isolate protein with the 3 isolate source Iso-P3™. 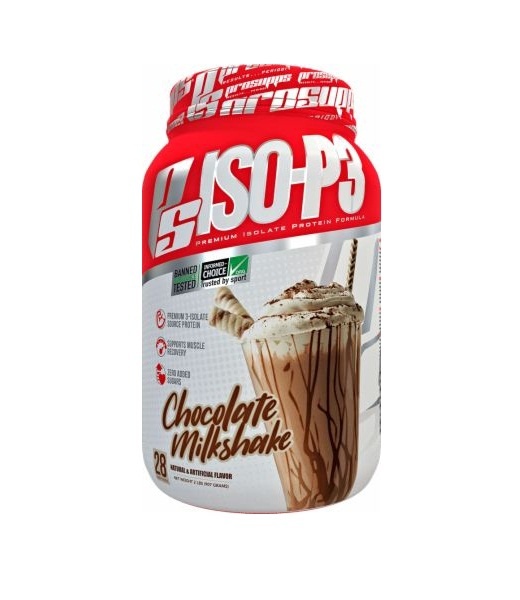 Directions For PS ISO-P3: For a great tasting, delicious shake combine each scoop (31g) of the all new PSISO-P3™ protein with 4-6 ounces of cold water (depending on personal preference for desired thickness). For added body, blend two or three ice cubes with PSISO-P3™ Protein. Use 2-3 servings daily. Always drink 12 to 16 ounces of additional water for each protein shake consumed.